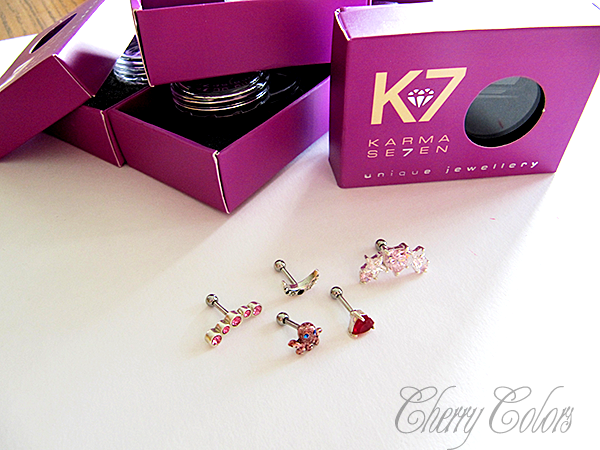 Review: Karma Se7en piercings - Cherry Colors - Cosmetics Heaven! 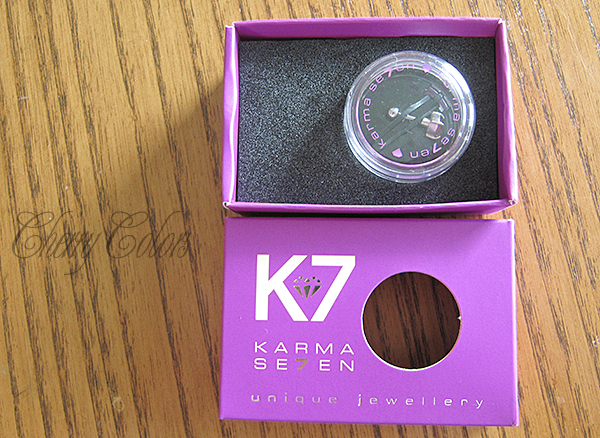 I was contacted by the company Karma Se7en about a possible review of their products. Since I am currently running low on tragus piercings and I wanted to write a bit about piercings, so.. of course I said yes! 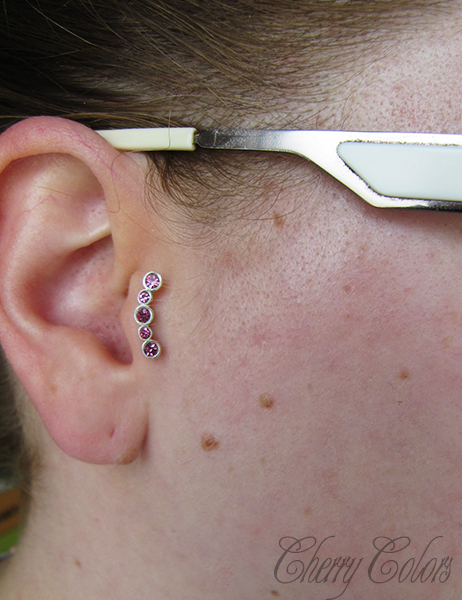 I was able to chose from the Cartilage piercings gallery, from where I fancied quite some of them. In fact I loved five of them, but was hoping they'd send me at least two. You know what? They did send me all five of them! Wooo! I must admit that at first I was kind of skeptical, because you know, I never heard about this site, right? But after some searching and looking around, I grew confident. I liked what I saw and I am sure some of my readers will love those items, too! The first thing I noticed about these piercings, it's the packaging. It's hard to go unnoticed, because it's one of the best packaging I ever saw. Every piercing comes packaged in a box inside of which is this tiny plastic jar. The plastic jar contains a black plastic disc with an elastic, in which the piercing is fixed. Around the jar there's a black foam kind of thing. Everything looks sturdy and extremely safe for travel. Here are the piercings I have chosen. All these piercings are made from surgical steel, have a external thread and the back ball is detachable. The front part isn't detachable. I think that when ordering from this site, it's better to order 1-2mm longer piercings, because I found that most of them had shorter steams than I expected (7-8mm). I usually wear a 7-8mm long steam in my tragus, but these were impossible to close by myself. Some were a tad too short, which is a shame. But they will be perfect for a upcoming helix piercing ;). 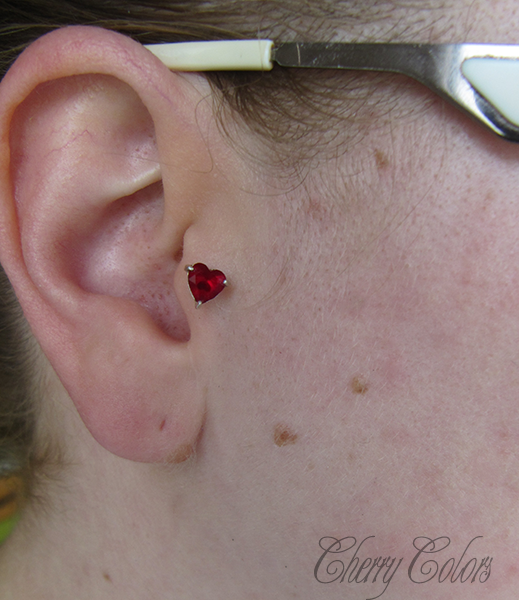 Crystal heart - a tiny red heart that looks lovely. I am sure it will look even better on a future helix! Moon - one of my favorites from the bunch. Love, love it! 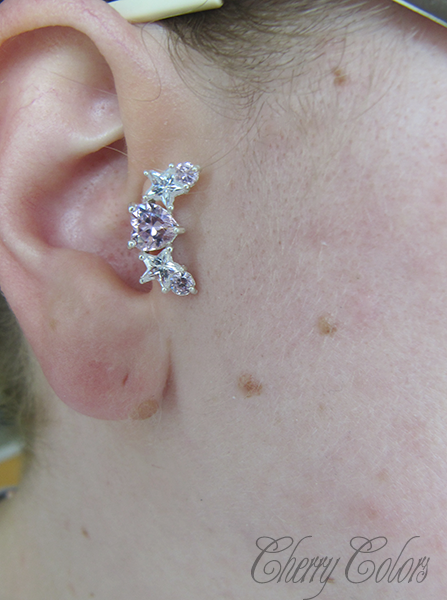 Jeweled upper ear stud - Beautiful and shiny. 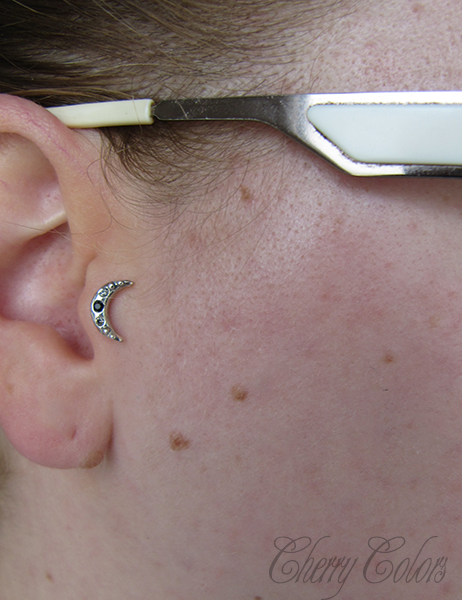 Maybe a bit too long for my tragus, but lovely either way. 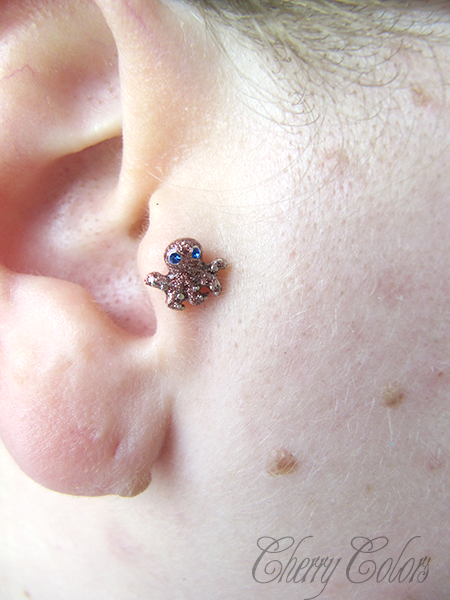 And the cutest of the bunch - Cute Octopus - I found it on their website and had a laugh or two. I got it because I thought it was hilarious. And when I got it, I was very excited. It's super cute and looks adorable in my tragus. Sadly, it's too short :(. I like that they have piercings I haven't seen anywhere else. Most are original and very creative. I tried checking cheap sites, expensive sites and nothing of even remotely similar came up. Kudos for that! also the jewelery looks sturdily made so it will survive many years of wear. Or sleeping on (like I do on my tragus, haha). My only concern is that they may not have the real length of the steams written on the site. I hope they'll fix that info, because once they do I suggest my readers to order with caution (I think that it's a good idea to order a longer piercing from the site). I am also sure that they are extremely helpful when answering customers questions! I think I'll want to try some septum piercings next (for my freshly pierced septum ;). P.S. I was informed that they do have a BOGO (buy one, get two) sale going on their site. It's automatic - when you put two items in your cart, it deducts the price of the lower priced one. EDIT: The store team informed me that they are working with their supplier, so the steams will be correctly listed/made with the correct steam length. This information pleases me a lot.